Access Profiles, Inc.: Do This Before You Give Money to Any Charity! 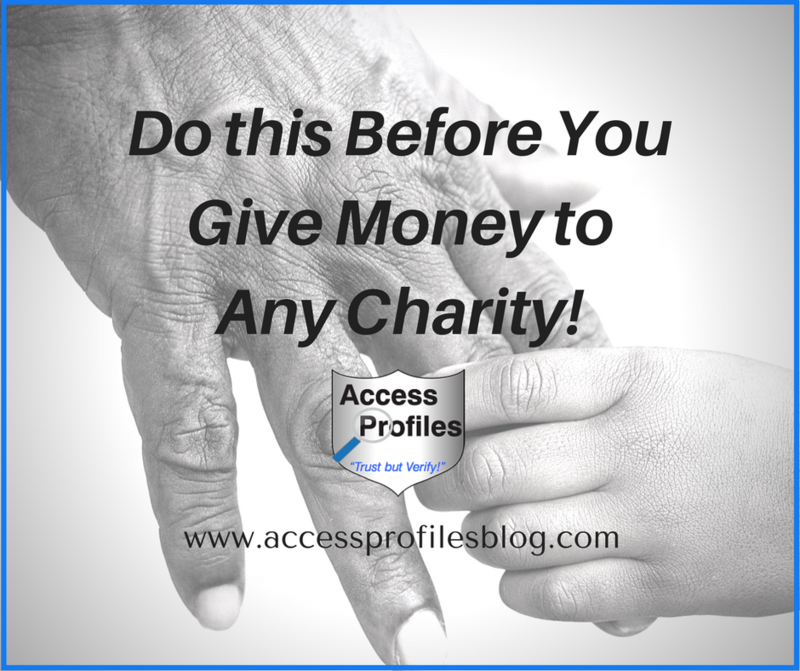 Do This Before You Give Money to Any Charity! do you really know where your money goes? Not long ago, I saw a commercial touting the benefits of buying “holy water”. The ad included “testimonials” on how the water brought these people new jobs, more money, or new homes. And while, by nature, I am a trusting person, these claims had the hair on my neck standing on end! Did people really believe that this “holy water” would suddenly take their lives in a drastic turn for the better? While I don’t believe most people would buy into this, it is troubling to think that some do! The reality is that it is never a good idea to take claims like these at face value, especially where your hard earned money is concerned. 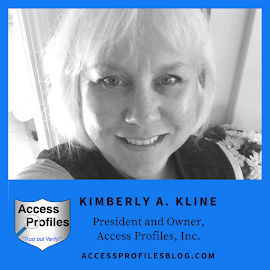 I have previously shared my thoughts on the importance of checking out the people and companies you are thinking of hiring (find my article here). But, you shouldn’t stop there! Shouldn’t the same diligence be used when it comes to giving to the causes and charities we believe in? Do we simply trust that the money we donate is going where it will do the most good? Or that they are even a legitimate charity at all? Are all charities really created equal? The answer to all of these questions is an emphatic “No”! That is why you need to do some research before you give! Despite the many good charities out there, there are also those that are complete frauds. These organizations try to trade on a person’s desire to help others only to line their own pockets. But how can you tell the difference between a legitimate charity and a Charity Scam? They won’t give you any details about their mission or where the money goes. They use a name that is close to, but not the same as, a well-known charity. They try to pressure you into donating immediately. They ask for cash or wired money donations. While it is obvious you should avoid giving to these scam charities, even a legitimate charity and their claims should be questioned. There are definitely things you should know about their practices before you give. 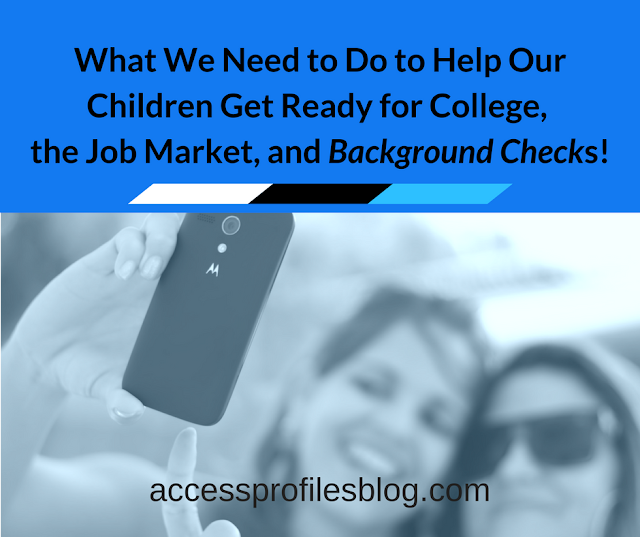 And number one on this list should be…… where does the money they raise really go? We all know it takes money to run any organization, even a charity. Employee salaries and other day to day costs are to be expected. But when paying high salaries seems to be more of a priority than helping those in need, then you should know that before you give. According to organizations like Charity Watch and Charity Navigator, it is best to donate only to those organizations where at least 75% of their donations go directly to aid the cause ~ and the best charities exceed that! That is why before you donate, take the time to visit a site like Charity Navigator first. Charity Navigator rates a wide variety of charities and lists information on the actual percentage of each donation that is spent on charitable works versus administrative and employee costs. But you can do even more! Knowing for sure that a charity is legitimate and truly focused on using your donation to fund good programs makes sense. Visit Charity Navigator and the Better Business Bureau (BBB) to see if they are a trusted entity. Look for any complaints or scams associated with the charity. Look for the Charity on Facebook, Twitter, LinkedIn, and any social sites. Read Comments and Reviews posted about the Charity. Verify the Charity is eligible to receive tax deductible donations via this IRS webpage. Get specific contact information (phone number, email address, etc.). Find out the charity’s donation procedures. Ask any questions you have about what the Charity does and how they do it. Discover if the charity or any of its top executives have been involved in a lawsuit, whether as the plaintiff or defendant. Focus on cases of fraud, embezzlement, or other crimes should be a red flag. Be sure to check any relevant county, state, or federal courts (limiting it to the federal district court and lower level courts where they are incorporated saves time). that your money will be going to good use. I believe we need to continue to be people that care about others and the world around us. It makes us human to be invested in their welfare, comfort, and way of living ~ not just in our own country but around the world. It is also important to remember that there are many worthy charities out there. They are the ones that focus their efforts on truly helping their cause and need your donations to continue. But it is just as important to be smart about it! before you make a donation is wise. is doing the most good! and Security Consulting Services too! 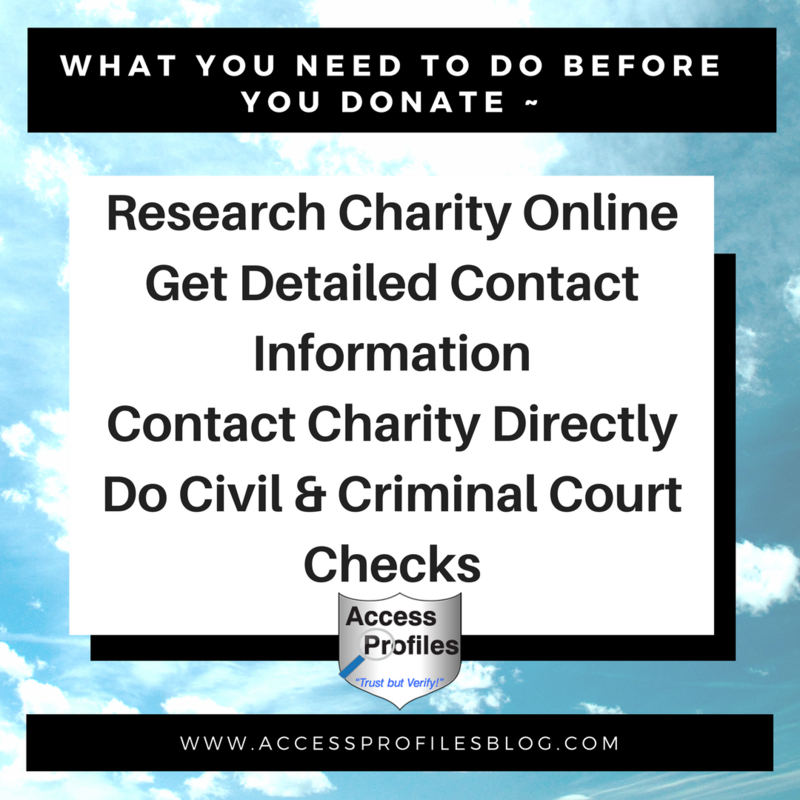 Labels: Background checks, BBB, charities, charity scams, civil court record checks, criminal checks, donate, fraud, IRS, what to do before making a charitable donation, where does a charity's donations go? What does Job Hopping Really Say About You?